Thailand’s most celebrated festival is the Songkran Festival. It starts at April 13 and lasts between 3 to 7 days, depending on where you are in Thailand. The word Songkran is from the Sanskrit meaning the beginning of a new Solar Year. Nowadays, Songkran is like an annually water war in Thailand, people always throw water on everybody who walks past their houses or walks down the street with cups, buckets of water, water guns, canons or anything else. Everyone gets wet, but it is all in a spirit of friendliness, blessing and fun. People who get wet actually do not get angry because they know that it is Thais tradition. On the practical side, this custom actually brings refreshing during the hottest season in Thailand. Begins on April 13th, everywhere in Thailand, Thais celebrate and enjoy the festival, especially in the northern part of Thailand. Chiangmai is the most famous spot for this festival, where thousands of foreign tourists join the locals in frenzied water war. 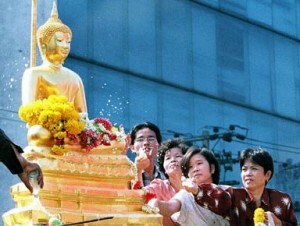 Several events accompany the celebrations, including a parade, a Miss Songkran contest and merit making at the temples. Besides, the old Siamese capital of Sukothai also takes the traditions pretty seriously, maintaining the historical dimension of the festivities. On the contrary, the capital of Bangkok becomes pleasantly quiet during Songkran week, since large percentage of residents would leave the metropolis and return to celebrate the holiday in their home province. Even with this mass exodus, you will still find pockets of definite wet zones around Bangkok, particularly on Khao San Road and the Patpong nightclub quarter. The underlying significance of Songkran is the process of cleansing and purification – the purging of all ills, misfortune and evil and starting the New Year afresh with all that is good and pure. Water is symbolic of the cleaning process and signifies purity. The Cultural Values inherent in the Songkran Festival are expressed through the various ceremonies and rituals. Songkran‘s value for community is to provide the opportunity to create unity in the community such as to jointly acquire merits and to meet each other and to enjoy the entertaining events. Society value, on the other hand, is to create concern upon environment with cooperation such as to clean houses, temples, public places and official buildings. Traditionally, Thais visit temples at this time of year to offer food to the monks and to participate in bathing ceremonies for Buddha images. At home, young people pour scented water into the hands of their parents and elders as a mark of respect and to receive the blessing of the older folk. Another custom is the releasing of small fish into rivers and canals. This merit-making act is thought to come from the old practice of collecting small fish from dried out pools, to keep and later release back into the wild.